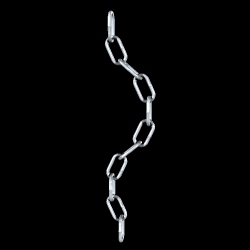 Chains by the inch or chains by the foot … Whether you’re securing that treasure trunk or have some nefarious scheme in mind, chains are the way to go. 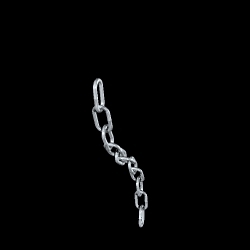 This package contains three different types of chains in four lengths (11, 25, 51 and 101 links) and two resolution levels (high and low) for a total of 24 figures. There are nine different texture schemes (two reflection maps are used to make four reflective schemes and there are five photo-based textures). 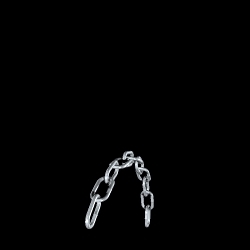 The EasyPose Chains by Ajax’s Twisted Visions uses Poser’s ability to use Enhanced Remote Control (ERC), where one “node” controls multiple body parts simultaneously. Installation: Installation is by unzipping directly into the Poser folder using the “use folder names” option in your zip program or by dragging the folders into your Poser folder. The EasyPose Chains are installed into characters:Twisted and MAT pose files into Pose:MAT Twisted. 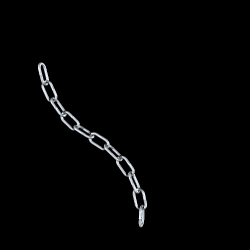 Just in case you’re interested, the objs are installed into Geometries:Twisted:Chains and the textures into textures:Twisted:Chains. No errors were noted in the installation. 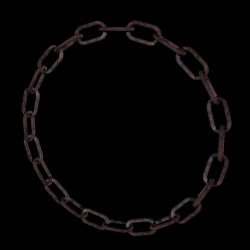 Loading: Like the DAZ Millennium figures, the chains suffer from “crosstalk” if you load two copies of the same one, so if you plan on using the same chain more than once in the same scene then you need to load the null version first, as you would for the Millennium figures. Null figures can be tricky so if you can’t make it work, check the instructions for an alternative method. If you don’t plan on using the same chain twice, you can forget about it. The chains load with no textures, so after loading you should use one of the MAT poses to set up the texture scheme you want. 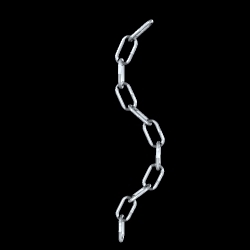 Appearance: These chains are very realistic looking. In fact, under the correct lighting and with the included textures applied, you really can’t tell that they are models at all. They come in three different types: A, B, and C, which are displayed below. Style A and B are typical chains, with B being a slightly fatter version of the two. Type C is almost a braid-like chain. Ease of intended use: Poser’s ERC technology allows a change in one part of the mesh to affect additional parts. According to Ajax, “EasyPose” is the specific application” of ERC used to make chains of body parts in which each body part possesses dials which can alter the position of all other body parts in the same chain. 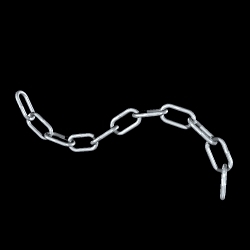 No matter which part of the chain you select, you can use it to alter everything else in the chain. Ajax has implemented EasyPose on the chains allowing one “node” to affect multiple body parts simultaneously. 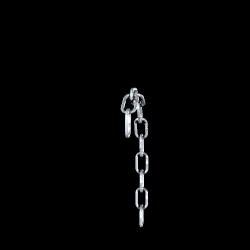 On the chains, the first link is the node and adjusting this node, adjusts the entire chain. 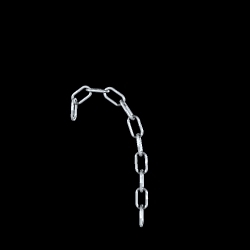 In addition, the individual pieces of the chains can control all pieces before them or all pieces after, allowing more complex poses. The dials work flawlessly and quickly. Extra features: There are several MAT files included with this package. 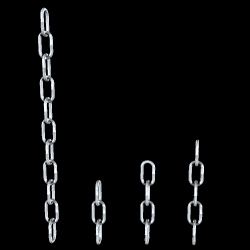 There are three different ones pictured below, which are applied to the same 11 link chain pictured to the far left. 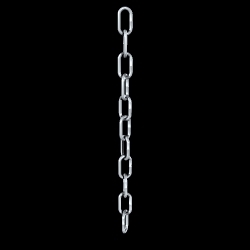 They change the size of the chains to 3, 4, or 5 links. MAT files for each of the textures, listed below, are included also. Material Zones: Each link contains it’s own material zone, which makes texturing very easy. Catenary Dials: In physics, a “catenary” is the shape made by a chain hung from two points. When set to a value of 1000, the catenary dials produce a perfect, mathematically accurate catenary. Values close to 1000 give an approximation to a catenary. There are five catenary dials to represent different distances between the two hanging points. If you want to pose a chain hanging between two posts or two hands, then catenary dials are the way to do it. Cost: Priced at $22.50, this package is definitely a good deal. Not only do you get some great models, the extra features included are well worth the buy. Hints & Tips: When using the channels, settings in the 50 to 60 range yield good results, but that totally depends on what you’re aiming to do. 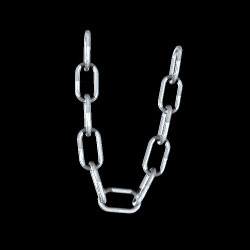 Hanley – These are some very cool chains!! The fact that you don’t have to spend time anymore using paths and replicating to make them is totally worth getting them. Plus, you get great extras with this package, and they’re easy to pose. Yep, I likem!! Darlisa – Another fun and easy to use product from Ajax. 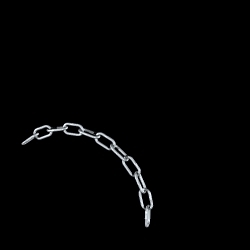 It is so much easier to bend the chains using EasyPose and Ajax includes several different chain types, textures, and lengths for all your twisted visions. Vic – The Easy Pose Chains are a very good product from what I have seen of them, have applied all mats, and have posed quite a few of the chains. Plus the transparencies to change the lengths work extremely well. I would have to say that they rate a 10 in my book, definitely worth the purchase.